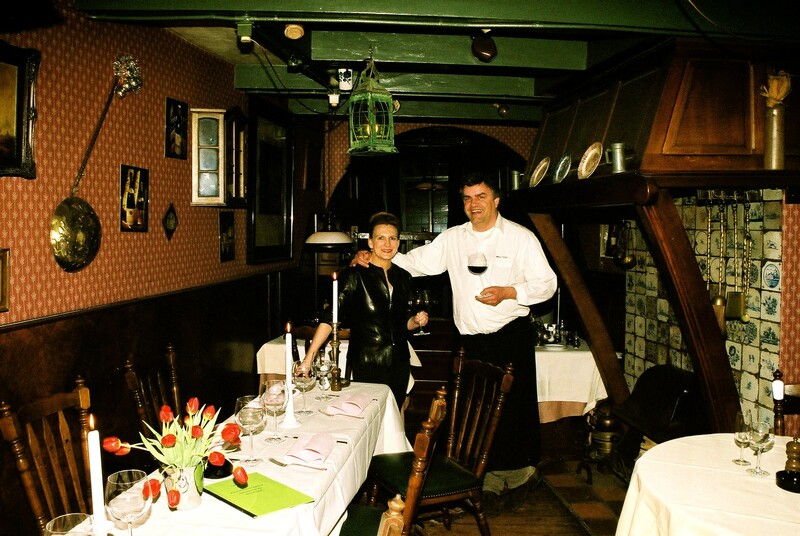 Yvonne and Roberto are pleased to welcome you in Restaurant De Groene Lanteerne, the smallest restaurant in the world in the center of Amsterdam on the Haarlemmerstraat 43. Our restaurant can receive up to 40 guests on two floors, the shape and the decor is like a boat, with here and there a separate corner. Yvonne Wolterbeek: born next to the restaurant Hoefslag to Bosch en Duin, then 6 years experience as a hostess at the Hoefslag. Roberto Ploeg: Kitchen Education; Restaurant de Nederlanden, Vreeland. SService Experience in: De Witte in Amersfoort, Juliana and finally sommelier at Restaurant de Hoefslag, Bosch en Duin where the combination Roberto and Yvonne was created. The previous Chef cook from Hotel Poland opened the doors of restaurant de Groene Lanteerne in 1950, the interior comes from the old church "Bickerskerk". Since 1992 until now we run this little restaurant and wine trade specialized in rare and special products and wines. langoustines, Zeeuwse oysters, scallops, Oosterschelde lobster, aspargus, suckling lamb, grouse, partridge, pheasant, sea-aster, truffle and caviar, but also Wagyu-and goose liver. dessert : soufflés, appelpie al minute, dulce de leche. Van volxem, Schloss Lieser, Robert Weil, Clüsserath Weiler, Daniel Vollenweider, Fritz Haag , Egon Müller e.v.a. Pinot Noir: Meo-Camuzet, Romanée Conti, Thibaut Ligier Belair, von Gleichenstein. Dessert wines : Sauternes, Eiswein , Beeren and Trockenbeerenauslese. Fine and rare wines. Founded in 1995 by Roberto Ploeg ( former Sommelier since 1977) and Yvonne Wolterbeek. Feel free to ask anything about the wine. Enjoy!